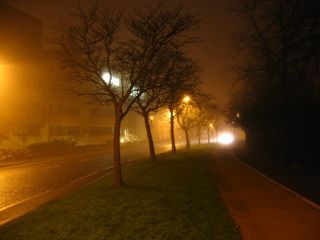 Along with thunder and lighting, fog is among my favourite atmospheric phenomena. The best thing about it is the way in which it reveals the characteristics of light: the diffusion around omnidirectional sources and the elegant linearity generated by point sources and sharp edges. The fact that it makes trees look atmospheric and intriguing is of considerable benefit. The fog today is apparently so bad that they are canceling flights out of Heathrow. I find that a bit surprising, as I thought commercial jets had RADAR guidance systems for takeoff and landing, to use under such conditions. They are justified in being concerned about takeoffs and landings. Along with Controlled Flight Into Terrain, approach-and-landing accidents have accounted for 80 percent of fatalities in commercial transport-aircraft accidents from 1979 through 1991. Given how crowded the airspace around London must be, extra caution is probably warranted; I imagine they would not be taking huge financial knocks for canceling flights without good cause. One unhappy matter photographic is that my Photo.net subscription expires in just over a week. Not to drive anyone too brazenly towards the donation page, but consider yourself gently nudged. [Update: 22 December 2006] Many thanks to Tristan Laing for setting me up with another year of Photo.net hosting. is it neccesary that you appear on PayPal as “SINDARKCORP”/”Sindark Coorperation”. You are certainly not a coorperation, so it is both a false marketing strategy, and also makes you come off as evil, as if you were in need of liability controls. Good points. I had to change the name of my PayPal account when I switched it to being a ‘business’ account. That way, it can receive credit card payments. When I did so, I had to change the name to something businesslike. It has now been changed again, to something more sensible and attractive. Planes can land using electronics, but the fog forced Heathrow to space out flights to avoid collisions. Then Clayoquot Sound in August would be a veritable photographic playground for you with the amazing fog that it gets. Also fun is boating at high speeds through fog so thick you wonder if you can actually see the bow or if there really is water below you. I would love to see it. I was quite sad when I proved unable to come visit you in Ahousaht (I hope I am spelling that correctly) before leaving for Oxford.